If Henry De la Beche ever thought himself criticized with undue harshness (and he did), it might have had something to do with his nose for trouble. 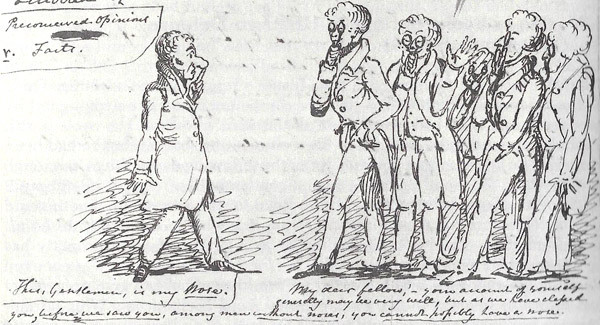 As a central figure in a protracted debate about geologic formations in Devonshire, De la Beche studied geology and drew caricatures in the early 19th century. His work, along with that of many other geologists, eventually led to the identification of major geologic periods in the Paleozoic. It was a bruising process, though, for De la Beche and his rivals. In 1834, Roderick Impey Murchison — one of De la Beche's fellow gentleman scientists — was publicizing his "discovery" that a rock formation known as the Greywacke (or Grauwacke) predated the appearance of terrestrial plants. If correct, this finding had huge economic implications. England's favorite 19th-century power source was coal, and coal seams are the remains of ancient swamps. If the Greywacke had no fossil plants, it certainly had no coal seams, and coal miners could save money by looking elsewhere. Unfortunately for Murchison, his hypothesis was wrong, and De la Beche found the proof: fossil plants in the Greywacke. Though poorly preserved, they bore a resemblance to plant fossils found in the Carboniferous (the formation best known for its coal deposits). De la Beche shipped a box of his newly discovered fossils with the understated note, "the specimens, as I need not tell you, acquire considerable interest." They also acquired Murchison's considerable animosity — he had already suppressed the paper of another gentleman geologist who contradicted his hypothesis. Murchison and his friend Adam Sedgwick presented a united front against De la Beche. When Murchison publicly questioned De la Beche's ability to identify rock formations, De la Beche should not have been surprised, but he apparently was. One result of the quarrel was this caricature. De la Beche: This, Gentlemen, is my Nose. His Critics: My dear Fellow! — your account of yourself generally may be very well, but as we have classed you, before we saw you, among men without noses, you cannot possibly have a nose. In fact, De la Beche probably projected an aristocratic air as much as his adversaries. The last part of his exotic-looking surname was pronounced "Beach." It always had been; his father added the trailing "e" and the prefix "De la" to emulate the name of a medieval baron. De la Beche habitually wore gold-rimmed spectacles and bright waistcoats. Not all of De la Beche's caricatures were barbs. When surgeon-turned-paleontologist Gideon Mantell — whose efforts De la Beche championed — earned his LL.D. (Doctor of Laws), De la Beche drew him wearing a laurel wreath with his Iguanodon dinosaur find in a puppy-like pose. And, to help out his friend and fellow fossil collector Mary Anning when her family fell on hard financial times, De la Beche painted a cheerful picture of a watery environment where marine reptiles chewed on little fish and each other, steadily depositing future coprolites. Copied by George Scharf and made into a lithograph, the picture was sold to geology enthusiasts, and the proceeds donated to the Annings. Some science historians credit De la Beche with inventing the field of paleoart — bringing to life ancient scenes — because of that illustration. Speaking of Anning, a figure looking a little bit like her appeared in one of the sketches De la Beche submitted for consideration as the Geological Society of London's official seal. Symbolizing science, the feminine figure fixed a lantern on a big globe "dispelling the darkness that covered the Earth," as De la Beche put it. De la Beche and Anning had known each other since their teens. Just a few years older than she was, he moved to Lyme Regis with his mother when he was 16, having just been kicked out of a prestigious military school. Whether or not De la Beche's emblem was the fossil hunter Anning, the light-bearing female didn't look much like the feminine emblems of science that had appeared in so many Enlightenment books, draped in form-fitting if not form-revealing cloth. This lady wore a stiff bonnet and a hoop skirt. De la Beche might have admired French science, but he was still an Englishman. In contrast to his fellow gentlemen, De la Beche had to work for a living in the 1830s. He had inherited a Jamaican sugar plantation that had provided a tidy profit — until the slaves working it were emancipated. Afterwards, he assumed a post as a geological surveyor, appointed the director of a survey of England and Wales in 1835, and his job often kept him away from scholarly meetings and debates he wanted badly to attend. Moreover, any criticism of his findings implied incompetence and jeopardized his employment. Although the criticism worried him, he and his job survived. De la Beche's career actually marked the beginning of a transition in geology as more geologists began to pursue the science as paid professionals. Having been a gentleman of leisure, he was in a good position to bridge the gap between those who had pursued geological studies in their leisure time and those who earned a living from it. His old nemesis Murchison eventually succeeded him as the head of the geological survey. Besides their long association, maybe De la Beche's own need to work encouraged his sympathy for Anning, whose contributions were not always acknowledged by other scientists. Despite some financial disadvantages, De la Beche enjoyed considerable success in geology, and was elected as president of the Geological Society of London in 1847 and again in 1848. He successfully petitioned Parliament for money to study Britain's soils and mineral deposits. And he used his 1848 presidential address to the society to pay Anning a public tribute. Although he benefited from the institution of slavery when young, De la Beche showed great respect for the less advantaged later in life, becoming a staunch advocate of educating all interested citizens, even those of the lower classes. He wrote textbooks aimed at working geologists. He founded the Museum of Practical Geology, lobbied for the establishment of England's School of Mines, and launched a series of scientific lectures for "working men," a tradition continued by Thomas Huxley. De la Beche's final years were difficult. Progressively debilitated by paralysis, he spent his last two years confined to a wheelchair. He died in 1855, aged 59.